In March 2019, Arts Visalia presents Art is Healing, an exhibition highlighting those who use art as therapy. Displaying an idea that art can impact people in a positive way, regardless of past experiences. Some exhibitors may have some sort of traumatic physical injury, some may have a mental illness, while others may have emotional stresses that cause them to turn to art as a source for healing. The public will see artworks from multiple organizations: Kaweah Delta Healthcare District, Family Services, and My Voice Media. The Art is Healing exhibition will be displayed February 27th through March 29th, with an opening reception on First Friday, March 1st, from 6:00 p.m. to 8:00 p.m. The exhibition is sponsored in part by Jack & Charlie’s, the Vintage Press Restaurante, the Southern Pacific Depot Restaurant, and Kaweah Delta Health Care District. Arts Visalia’s Young Imaginations Gallery will display the artworks of the 5-17 year old participants of our children’s classes year-round. Please stop in and take a look. In April 2019, Arts Visalia will display Tattoo, an exhibition offering the community a culmination of local talent. 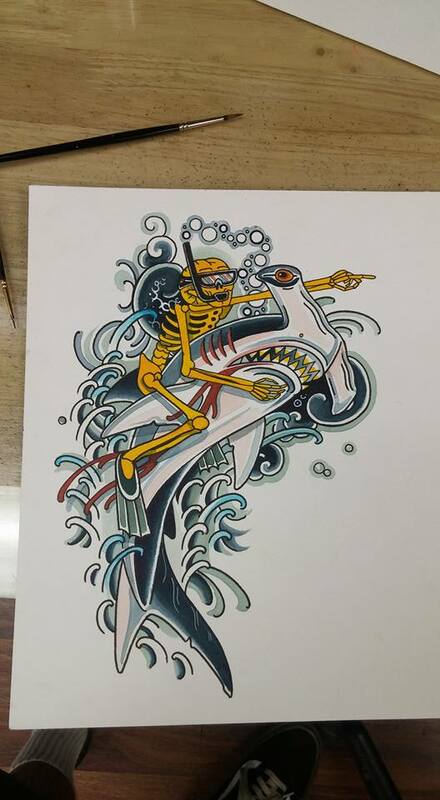 The artwork consists of tattoo sketches, photography of tattoos, 3 dimensional artworks, and other artworks made by the tattoo artists. Arts Visalia’s adult and children’s art classes for spring are underway at Arts Visalia. For more information and class descriptions, please go to artsvisalia.org, call us at (559) 739-0905, or visit us at the gallery at 214 E. Oak Ave., Visalia, CA 93291.